After a snowy weekend I am back in the studio. Winter has really shown itself this year and we are digging out of 17″ of snow. Though, it is beautiful while it falls and white snow brightens the gray days. Today’s photo is of the piece, A Different Perspective. I loved creating this design…A photo that I took in a backyard garden was the inspiration. I loved the vivid colors and the composition of the small flower as seen from the bottom. I thought the unusual design it had from this angle gave a different perspective, or view, from how we normally look at flowers. And of course, what could brighten a February day better than this!? A Different Perspective, 45″ x 45″, rayon on cotton , © 2014 Joni Beach. Pieced, free-motion quilting. applique, thread=sketching. The photo was enlarged and a size was selected. I used the copy as a guide to make the individual pieces and assembled the flower on batting. This was shown in an earlier post...See Here! A glue stick was used to “tack” the design together. This allows for moving pieces and making changes as I work. After the basic flower was formed, details were added and layered on top. The background was then placed around the central design. Extensive thread-sketching was used to finish the raw edges and bring out the sections of the flower. Thread-painting was then used to add contouring and shading. I used dense-stitch quilting using free-motion techniques on the background, which gives dimension and accents the flower. A facing was added to finish the edges and a hanging sleeve was added to the back. I try to remember to always sign and date the wall-hanging in thread, using free-motion quilting! 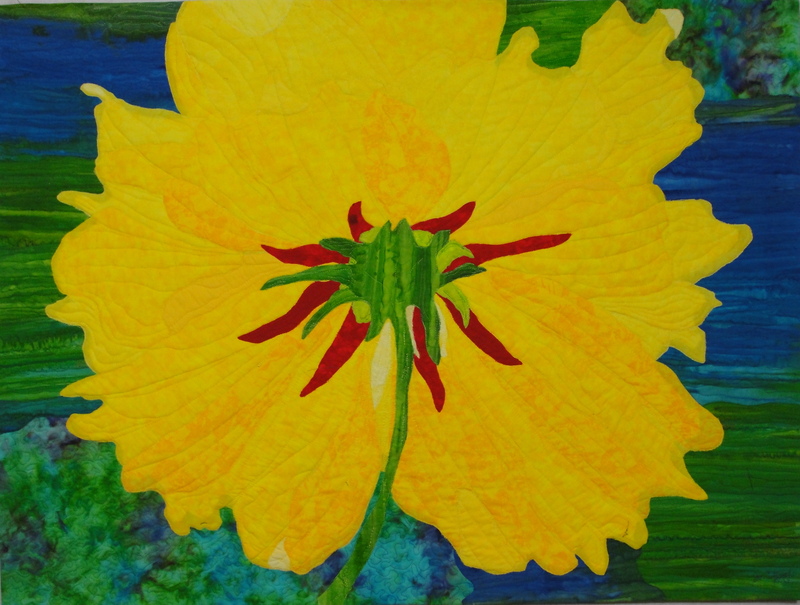 You can see this and other art quilts in my website’s Art Gallery! Available Artwork May Be Purchased Through: Eucalyptus Massage Center Gallery.